Recently, interesting ads for Autan were set up near the two most well-known lakes in Zagreb, Jarun and Bundek, where Zagreb locals regularly come to barbeque and enjoy the natural surroundings. The ads are installations that literally protect visitors from mosquitos thanks to a mesh, representing a metaphor on the effectiveness of Autan. Among the many gazebos surrounding the lakes, these Autan gazebos soon became the most popular ones with the first appearance of mosquitos. “I’m glad that nowadays when market communication is dominated by new media and platforms, a place was found for good old ambient ads. I have a kind of nostalgic relation towards ads like this because these were the ads that dominated my early career” – says Igor Mladinović, chief creative director of the Imago Ogilvy agency. Innovation Director of the Imago Ogilvy agency DarkoBosnar says “the originality of the idea lies in the use of the medium, that is in the use of an already existing structure in the environment as an advertising medium. 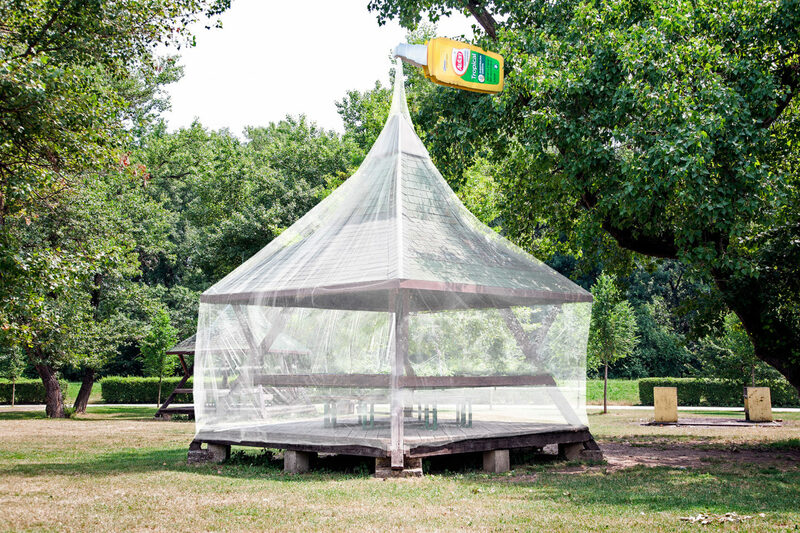 With a very minimal intervention into structures already there in the physical environment, gazebos where people seek protection from the sun, these structures acquired an additional function, and now offer protection from insects as well. The interesting coincidence that the gazebos on Jarun and Bundek are shaped like a spurt of the anti-insect spray advertized complemented in this case the outdoor advertising idea in a completely new way.